Dublin 1930-1950 by Joseph Brady. Published late last year this 448-page volume is the 5th publication in The Making of Dublin City series edited by Joseph Brady, Anngret Simms and Ruth McManus. This volume, penned by Professor Joseph Brady, a geographer at UCD, is a substantial investigation into the physical and economic development of the city spanning two decades. Brady’s timeframe overlaps in places with a previous work in this series by Ruth McManus, who dealt with the development of Dublin’s suburbs from 1910 to 1940. This new tome deals with themes that move from the expansion of Dublin into the residential suburbs of Dublin back to the development at the city core. Examining shopping, infrastructure, parking, transport, entertainment and consumer prices, Brady squeezes information from every source and paints a layered picture of the city and its complex development. This volume, by Professor Joseph Brady, UCD, is a substantial investigation into the physical and economic development of the city spanning two decades. 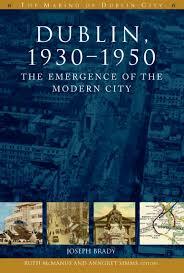 Dublin 1930-1950 The Emergence of the Modern City begins with a profile of the city in the 1930s. Brady uses available census data to paint a broad picture of the city, its industry, built environment and its population. Brady’s use of sources is thorough and sometimes heavy going but well worth reading for anyone interested in the history of Dublin city. Population patterns and migration to the urban and suburban areas of Dublin are explained with great attention to detail. Having established the tendency for migration to Dublin the question of housing becomes the focus of several chapters. Brady describes the housing issue as the physical manifestation of inequality and his description and comparisons of the wealthy suburbs to those of the corporation social housing estates emphasise the point. The growth of suburbs away from the city core necessitated changing of Local Government boundaries. Here Brady uses the examples of Pembroke and Rathmines to the south and Howth to the north to explore the ramifications of those changes. By delving into the political issues and debates surrounding town planning the author reveals a conservative attitude and reluctance to embrace planning ideals, which were often seen as an expensive luxury. Following on from Ruth McManus book on the growth of Dublin’s suburbs Brady here picks up the story of some of the social housing developments that shaped the city. Public Utility Societies, Philanthropy and Local Government were all involved in the development of working class housing during the period under investigation. Here Brady specifically deals with Cabra and Donnycarney. He also examines the development of the middle class garden suburb. By concentrating his research on specific areas like Mount Merrion, Brady is able to focus in on the builders, the building types and rising costs of home ownership. By looking at things like furniture, gardens and space for cars, this kind of investigation reveals a lot about the expectations of Dublin’s middle class and their acceptance of a suburban lifestyle. Many locations were suggested for a new cathedral including Capel Street and on the Quays opposite the Four Courts. Eventually the government agreed to allocate Merrion Square, a site that had previously been touted as the location of a war memorial, as a site for a new Cathedral. Brady delves into this twenty-year saga, the details of which are fluently investigated, the result was a lot of discussion, bureaucracy and rumour and obviously, no new Cathedral. Other chapters in this book deal with infrastructure, shopping and entertainment. An in depth discussion of the development of Dublin’s own infrastructure, dealing with roads, bridges and public transport, may not seem an inviting read at first but here it proves to be a very enlightening and innovative method of explaining the development of the city. The development of Dublin airport and the decision to locate it at Collinstown, north Dublin, will be of interest to many Dubliners. Shopping and entertainment are explored in wonderful detail giving insight mainly into the experience of the cities middle classes as well as historical insight into familiar stores such as Arnotts and Brown Thomas. It is an interesting period as Ireland was emerging from the rationing and shortages, which was a feature of World War II, into an era of growing consumerism. The development of Dublin airport and the decision to locate it at Collinstown, north Dublin, will be of interest to many Dubliners. Here Brady admits that the focus is on the wealthier sections of Dublin’s middle class, he does not explore the lower end of the market or areas like Thomas Street and Moore Street Markets, which would have provided us with some insight into how the poor of the city coped in this period. However the information he does provide gives us an insight into the development of the main shopping areas and explains the origins of some of the modern day quirks of the city. Finally Brady examines some tourist brochures and personal accounts of the city. This gives an indication of what visitors to the city were being directed towards. The highlights in post war Dublin; Nelson’s Pillar, Phoenix Park, the city’s hotels and restaurants among other attractions, are discussed here. Overall Brady’s work is thorough and while it cannot be described as light reading it is exemplary research worthy of the high standard of The Making of Dublin series. 2 Responses to "Book Review: Dublin 1930-1950"